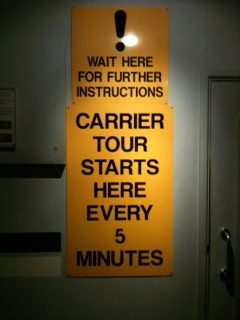 I am sure Leornardo da Vinci would have happily patronised the Fleet Air Arm Museum. Leornardo da Vinci said “Once you have tasted flight, you will forever walk the earth with your eyes turned skyward, for there you have been, and there you will always long to return” and I am pretty sure he would have added “and if it’s a rainy day, head over to the Fleet Air Arm Museum for all things aerial”. If it’s your first time at RNAS Yeovilton, you would be forgiven for thinking you had taken a wrong turn as you find yourself in the middle of a working naval base. HMS Heron is a 1,400 acre multi-role station and one of the busiest military airfields in the UK as well as being a training ground for air crew and an RN Fighter Controller School. From the 1st floor you can scan your eyes over the content of Hall 1 to give you a flavour of things to come. 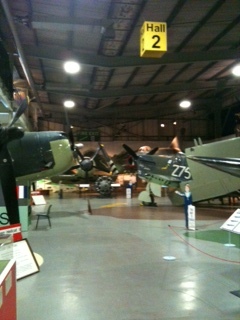 You can also look at the Battle of Taranto display and the story behind Operation Skua. Hall 1 tells the story of our fascination for flight; from the flimsy replica of the Short S27 that bears a remarkably close resemblance to Leonardo’s 15th century sketches to the Westland Lynx and Sea King helicopters. For me, it was the Westland Sea King XZ57 that really brought it home to me – just how these immense, militarily laden crafts ever manage to get off the ground! 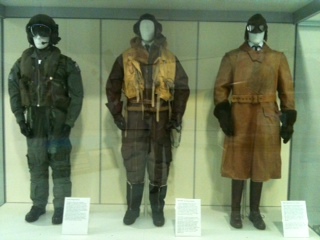 There is also a large display cabinet exhibiting the clothes worn by the RAF during World War I, (the pilots often used standard driving goggles to protect their eyes!) through to World War II and today’s modern protective gear. Another reminder of just what the pilots had to cope with on top of fighting the enemy. Having witnessed man’s insatiable desire to grow wings, you move into Hall 2 where you will find a large assortment of World War II and Korean War craft, including the North American Harvard III (EX976),the Grumman Avenger and the Fairey Firefly Mark 1 Carrier Fighter 1943, along with various memorabilia and huge model aircraft carriers that sit proudly behind their glass cases. There is also the Japanese Kamikaze Exhibition, the facsimiles of letters sent home by some of these fanatical airmen and the personal belongings remind you that behind the façade of these extremists were the more normal human elements of men who had families and loved ones. 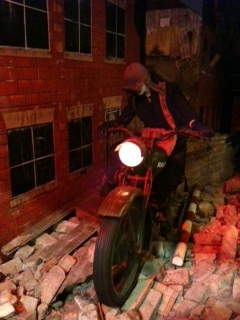 The WRNS WW II messenger making her way through a bombed city on her motorbike always captivates younger children’s attention, but it is worth mentioning if you have family members who are unnerved by the likes of Madame Tussauds, then you may want to give this side of the hall a wide berth! From Hall 2 you can reach the Merlin Experience and Gallery; you will find loads of information on the Merlin Helicopter and there are plenty of interactive screens and a cockpit flight simulator for both children and adults to enjoy. 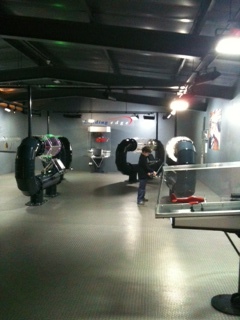 There is also a viewing room where you can watch any aircraft activity that might be happening on the base. But it is the award winning Aircraft Carrier Flightdeck Experience that is one of the most popular areas of the museum you will find on the far side of Hall 2. You will take a ‘virtual’ ride in a Wessex helicopter that takes you on board HMS Ark Royal (a reconstructed flight deck and operations room of a 1970’s aircraft carrier) where ‘museum meets theatre’, combining special effects and the recorded sounds taken from a working flight deck. 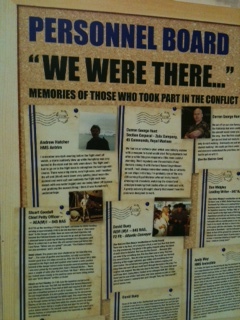 You will also find yourself amongst genuine aircraft including the Phantom and Blackburn Buccaneer in Hall 3. The ‘guided tour’ is with the help of Petty Officer Redfearn who appears on TV screens throughout the tour of the ‘Island’ where they have recreated cabins and operational areas from the Bridge to the ‘Goofers Deck’. But as with the other life-like exhibits, take into account anyone spooked by dressed ‘dumbies’! 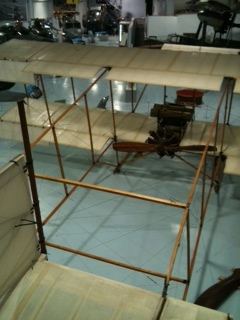 Hall 4 holds the ‘Leading Edge’ exhibition that recalls when Britain was at the forefront of aviation technology. 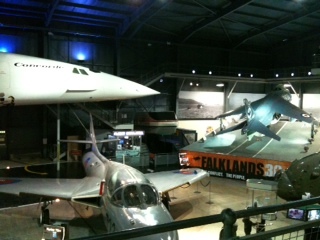 It houses the Concorde 002 (Britain’s first Concorde and the second one built) that you can board to see the interior and cockpit and there is an area dedicated to the Falkand Conflict of 1982, including interviews with veterans and Falkland islanders. This conflict was the biggest naval operation since World War II. Another very popular exhibit that welcomes you ‘on board’ is the cockpit of a Sea Vampire where anyone can imagine themselves as a fighter pilot on manoeuvres! 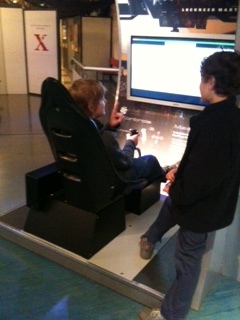 For the more adventurous, there is the SuperX Flight Simulator (separate charge applies). Across the road from the main museum is Cobham Hall that houses the museum’s Reserve Collection. Due to the unique nature of this highly valuable collection of rare aircrafts, records and artefacts, it only opens once a year. So do check opening times to avoid disappointment. 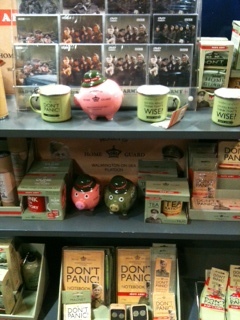 As you leave the museum, as you would expect, you have to make your way through the museum shop. This sells the usual paraphernalia, but there is a pretty good choice even for pocket money souvenirs! I can’t say the Swordfish Restaurant is particularly good, the food is mediocre and pricey and I would personally recommend a family picnic on the lawned area – weather permitting! The Fleet Air Arm Museum is definitely worth a visit and if you buy the Gift Aided Annual Membership, you can return as often as you want over the next 12 months, so worth remembering for those rainy day holidays! 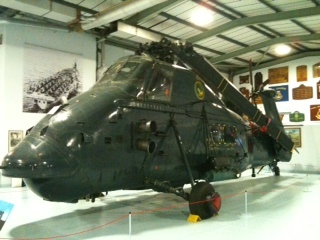 This entry was posted in Family Days Out and tagged aeroplane, AgustaWestland, aircraft carrier, aviation, Falklands, family, Fleet Air Arm Museum, flight, helicopter, Kamikaze, Leonardo da Vinci, pilot, plane, RAF, Sea King, second world war, Yeovil, Yeovilton. Bookmark the permalink. 2 Responses to I am sure Leornardo da Vinci would have happily patronised the Fleet Air Arm Museum. Apparently for those braver and in better health than myself can experience a loop the loop flight! Thank you for the comment Gerry, I think our aircraft history, as with so many other aspects of our history, has a wonderful story to tell & I am sure the Classic Air Force Museum will do very well.